Female impersonator holding long gloves, Hempstead, L.I. 1959Purchase, Joyce F. Menschel Gift, 2015 Courtesy The Metropolitan Museum of Art, New York/Copyright © The Estate of Diane Arbus, LLC. All Rights Reserved. In her short but prolific career, Diane Arbus made a name for herself photographing outsiders – people who lived on the margins of society and whose presence in her images made for arresting, at times disconcerting, viewing. Arbus’ working years – from 1956, when she started out as a photographer under her name, to 1971, the year she committed suicide – saw her adopt a spontaneous approach to the medium, often wandering the streets of New York in search of her subjects. Her method was one of adaptation: “I work from awkwardness,” she once said. “By that I mean I don’t like to arrange things. If I stand in front of something, instead of arranging it, I arrange myself.” Arbus interested herself in a broad spectrum of the city’s society, from the refined to the gritty, approaching each subject with the same level of openness; a new show at London’s Hayward Gallery, diane arbus: in the beginning, explores such traits through the exhibition of more than 100 of her photographs. Intimate, visceral and engaged, Arbus often established close connections with her subjects. Children in the street, transgender individuals, strippers, carnival workers, and beachgoers all found themselves in front of Arbus’ lens; she would photograph the people that she found interesting, because she was determined to communicate her own idiosyncratic point of view. “I do feel I have some slight corner on something about the quality of things,” she said. “I mean it’s very subtle and a little embarrassing to me but I really believe there are things which nobody would see unless I photographed them.” This unique way of seeing, coupled with pioneering photographic techniques – the image-maker would routinely, and unusually, use flash outside in daylight, lending to her black and white prints a sharp focus on the subject before a slightly hazy background – established Arbus as one of the 20th century’s most significant American photographers. The Hayward Gallery’s exhibition places focus on how Arbus developed her singular, and groundbreaking, approach to photography in the first half of her career. The square frame for which Arbus became known had not come into play yet during these years: prior to using a Rolleiflex, which would create the square frames, Arbus used a 35 millimetre Nikon camera. 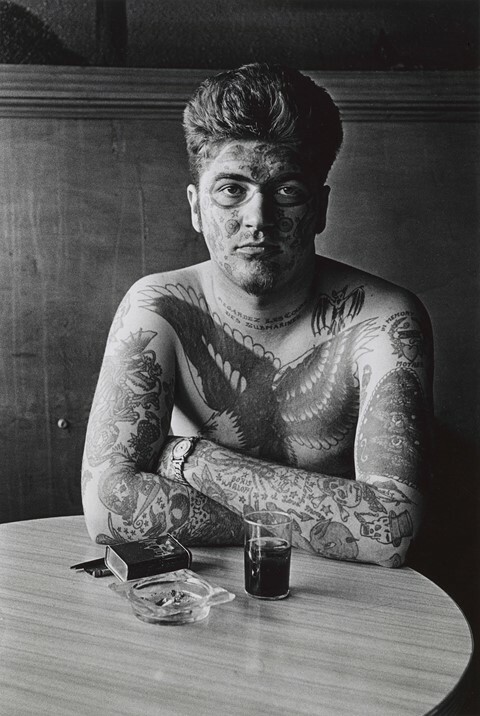 Many of the prints exhibited – of which a large portion have never been shown in the UK – are originals, produced by Arbus herself. Jack Dracula at a bar, New London, Conn. 1961Promised Gift of Doon Arbus and Amy Arbus, 2007 Courtesy The Metropolitan Museum of Art, New York/Copyright © The Estate of Diane Arbus, LLC. All Rights Reserved. Eschewing the traditional exhibition format of rooms with mounted photographs, the Hayward Gallery has created an unstructured exhibition for diane arbus: in the beginning (the exhibition has been adapted from a 2016 show of the same name at the Met Breuer in New York). Photographs are framed and displayed on a series of tall, plinth-like walls which populate the whole space of two rooms in the gallery, creating a labyrinthine effect that encourages weaving between images. The effect is entirely immersive, with the feeling of walking among the New York characters of Arbus’ photographs. 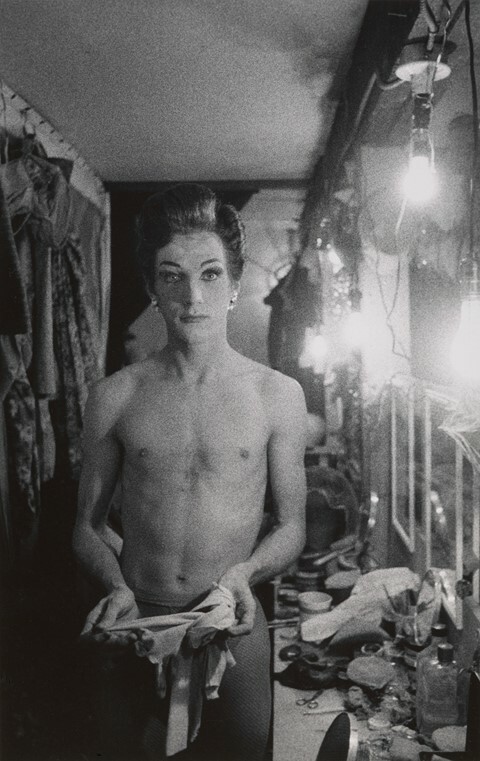 diane arbus: in the beginning is at the Hayward Gallery, London, from February 13 – May 6, 2019.